Capacitor is the one, that deals with capacitance(is the ability of the conductor to store charge) of the conductor. In other words it can be stated as a device that stores electrical charge (indirectly electrical energy). I is directly proportional to q. As capacitor deals with capacitance it is necessary to know what capacitance numerically is. The ratio of charge supplied to conductor to electric potential is a constant in given environment and that constant is called as capacitance. The SI Unit of the capacitance is Farad(F). The Farad is a higher unit of capacitance since coulomb is a higher unit of charge. So,lower units of capacitance are micro-farad(uf),pico-farad(pf). A capacitor is composed of two conductors separated by an insulating material called a DIELECTRIC. The dielectric can be paper, plastic film, ceramic, air or a vacuum. The plates can be aluminium discs, aluminium foil or a thin film of metal applied to opposite sides of a solid dielectric. 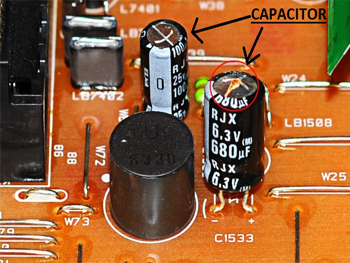 Capacitors can be classified into two types. In these type, condenser values are fixed(we can't change its values). We can get the values of the capacitor by the printed value on Capacitor container box. There are six different types in this capacitor. In these type, we can change the condenser values by rotating the screw or shaft in the capacitor. There are two different types in this capacitor. AC Capacitor: They are not polarised (do not have a positive and negative lead). We are using this capacitors in Fan,Electric Motor etc. They help in starting electric motors independently and save the motors from the electric fluxion. This capacitor size is big. DC Capacitor: In electronic circuits we use DC Capacitors. There are two types in this capacitor. Electrolytic capacitorsare 'polarised' which means that have a positive and negative lead and must be positioned in a circuit the right way round (the positive lead must go to the positive side of the circuit). They also have a much higher capacitance than non-electrolytic capacitors. Non-electrolytic capacitorsusually have a lower capacitance. They are not polarised (do not have a positive and negative lead) and can be placed anyway round in a circuit. They are normally used to smooth a current in a circuit. A colour code was used on polyester capacitors for many years. The colours should be read like the resistor code. The top three colour bands give the value in pF. The 4th band is for tolerance. The 5th band is for the voltage rating. brown, black, orange means 10000pF = 10nF = 0.01µF. wide red, yellow means 220nF = 0.22µF. Note: There are no gaps between the colour bands, so 2 identical bands actually appear as a wide band. Now having known the value of capacitance,let us come to know its correctness(ie:capacitor is Good, Short or Open) using multimeter. Suppose you want to check the Capacitor (for example, Fan Capacitors, Electric Motor capacitor etc). Detach the capacitor from the instrument whose correctness has to be determined. Now connect these leads with 230 V AC Supply for very short time (1-4 Sec). Remove Safety leads from 230 V AC Supply. Now Short the Capacitor Terminal. If it makes a strong spark, then capacitor is good. If it makes a weak spark, then it is a bad capacitor and has to be changed immediately. Note: This method is dangerous, please be careful when we doing this. Take an Analog multimeter and set it to ohmic range. Connect the Multimeter leads to the Capacitor terminals. Note The reading and Compare with the following results. Short Capacitors: Shorted Capacitor will show very low Resistance. Open Capacitors: An Open Capacitor will not show any movement (Deflection) on multimeter. Good Capacitors: Initially, it will show low resistance, and then gradually increases towards infinity. It means that Capacitor is in Good Condition. Set the meter on Ohm range. Connect the Meter leads to the Capacitor terminals. Digital meter will show some numbers for a second. Note the reading. And then immediately it will return to the OL (Open Line). Every attempt of Step 2 will show the same result as in step 4 and Step 5. It means that Capacitor is in Good Condition. If there is no Change, then Capacitor is dead. Detach the capacitor from the circuit. Set the multimeter to "Capacitance" range. Now connect the capacitor terminal to the multimeter leads. If the reading is near to the actual value of capacitor (i.e. the printed value on Capacitor container box). Then the capacitor is in good condition(may be less than the actual value of capacitor). If the noted value is infinity or exceeds the actual value then the capacitor has to be replaced by the capacitor with the required value. We can do the method 4 with a multimeter if we have a Capacitance range on our multimeter. In the high voltage condenser(we are using this capacitor in T.V etc) if we disconnect the main line, charges remain in the capacitor. So, before touching the circuit we must dis-Charge the capacitor. We must remember this thing. Failing to remove power from the circuit or discharge capacitors could result in damage to your multimeter in addition to misleading measurements.